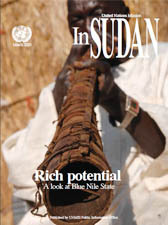 This story was published on UNMIS and ReliefWeb websites last month and now it’s being republished on “In Sudan” magazine, March 2010 issue (page 15). With food insecurity rising after last year’s poor harvest, the World Food Programme (WFP) almost doubled its delivery of rations to Upper Nile State from 16,000 to 27,000 metric tons on 1 March, according to a UN official. The agency allocated 70 per cent of the tonnage to general food distribution and 30 per cent to returnees/refugees and other micro projects, said UNMIS Return, Recovery, Reintegration Officer (RRR) Tito Awando. “In case of emergency, WFP will do contingency stocks, which can be accessed easily when required,” added the RRR officer, who also acts as focal point for an integrated team addressing humanitarian needs in the state. The WFP distributed rations based on census figures to a total of 858,869 individuals in all Upper Nile counties except Renk, which has a food surplus, Mr. Awando said. The main beneficiaries were the elderly, lactating mothers, terminally ill and disabled heads of families. Based on the 2009/2010 South Sudan Annual Food Security and Livelihood Assessment (ANLA), food security in the region has further deteriorated as a result of drought and insecurity. Some 4.5 million people or 70 per cent of households are currently food insecure in Southern Sudan, compared to 40 per cent last year, according to the ANLA report. I think as America continues to evolve, the census form needs to do a better job of keeping up with the changing face of our population. My children, my grand-children, and my grand-parents are multi-racial. Since there is no category on the census form that says Ghetto-Gold, the politically correct catch phrase that best describes me is African-American. And when I’m not filling out some politically suspect form, I’m happy to just be an American.